Fear and anger may be the most recognized, if not common, stress emotions, but let us not forget that there is another emotion associated with stress, specifically eustress. This emotion is joy, also referred to by some as happiness. The emerging field of positive psychology has placed joy and happiness as a big X on the psychological treasure map. The search for happiness has begun in earnest in all corners of the globe. A quick look at the titles in the self-help section of any bookstore, from authors including the Dalai Lama, Harvard professors and HBO comedians, reveals that the pursuit of happiness is a hot commodity in the age of 21st century stress. Simply stated: Joy is the antitheses of distress. While some researchers in the field of positive psychology insist that joy is the anticipation of an event, spiritual luminaries suggest that happiness is a state of living in the present moment. Happiness, however, isn’t just a psychological issue. It appears to be a leading economic indicator as well, which may explain why experts in the field of economics also contribute significant amounts of research to the happiness data collection. Interestingly, the Asian country of Bhutan measures their country’s growth not just in GDP (Gross Domestic Product) but GDH (Gross Domestic Happiness). Other countries, such as England and France are considering similar measures. Is happiness a function of nature or nurture? Experts suggest that it is combination of both. The pursuit of happiness is an internal quest. No amount of external possessions or experiences can create long-term happiness. Nor can money buy happiness, though lord knows, people surely try this method. First and foremost, happiness is a perception—and we have the choice to choose our own thoughts. In the words of Abraham Lincoln, “People are about as happy as they make up their minds to be.” Can you jumpstart your happiness quotient? Yes! Start by making a list of all the things you are grateful for in your life. Don’t stop till you reach 100. Being of service to others in need is also a great way to find balance your scale of emotions. Finally, be on the lookout for things that make you smile each day. Take time to nurture the nature of your happiness! I consider myself a pretty happy guy, but there are moments in my life that rank up there as unadulterated eurphoria. 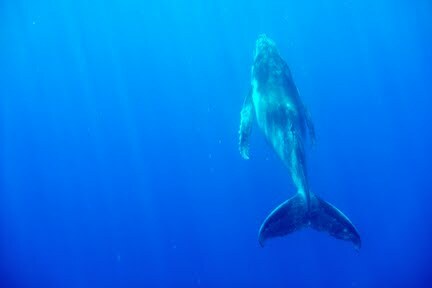 Just last month, while swimming in the South Pacific— near the island of Moorea, I had the pleasure to be joined by a baby humpback whale. UNREAL! I am still on Cloud #9 from that experience. Here is the proof. Enjoy!